Woodland products were of great importance in the past, and in the middle ages woods were carefully managed, usually by coppicing. When harvested, the coppiced tree would send up new shoots from its base, so did not need to be replaced by a new plant, and when timber trees were felled, a new tree would naturally regenerate from seed. Thus when Bishop Vesey established the managed woodlands in Sutton Park in the 1530s he spent no money on tree-planting, but it was the construction of the woodbanks with their fences on top which cost him £43 2s. 6d. These woodbanks enclosed the “seven hayes” - Holly Hurst, Upper and Lower Nuthurst, Pool Hollies, Darnel Hurst, Streetly Wood and Lady Wood. The woodbanks were required keep out grazing animals which would otherwise interfere with the natural regeneration of the woodland, so presumably there were already plenty of trees in the seven hayes created in 1530. The creation of new woods by the planting of tree seedlings on prepared ground began in England in the seventeenth century, and very many such planted woodlands or plantations were established in the eighteenth century. The Warden and Society of Sutton responded to this plantation movement by creating a new wood at Westwood Coppice. Although the soil there was very poor, contemporary treatises on forestry showed how it could be improved. First “we plough the ground with a double-furrow trenching plough” and then sow a crop of barley to bring the ground into better heart for tree-planting. Sir Robert Lawley of Canwell Hall, himself a great advocate of plantations, was Warden in 1776 at the meeting of the corporation on May20th. At the meeting, it was decided to “look into Mr. John Kendrick’s accounts for horsing and sowing Westwood Coppice”, and on August 12th “Warden to employ proper persons to cut the corn growing upon Westwood Coppice and advertise it to be sold by auction.” The corn was sold to Mr. Kempson for £60. Meanwhile the two yeomen appointed to look into Kendirck’s accounts, Adcock and Simkin, reported that he had overcharged for the work; at the meeting of October 19th Kendrick was ordered to repay “some of the money received for ploughing etc.” This he refused to do, and at the December meeting the Warden and Society decided not to take legal proceedings against a member of their own body (Kendrick was a member of the Warden and Society, he or his father had been Warden in 1755), but to reprimand him and never again employ him on corporation work. So it was not Mr. Kendrick who planted the trees over the next winter. Bearing in mind the name given to the new plantation, a coppice must have been established whereby the trees were to be cut down every so often, new shoots would grow from the base, the process being repeated again and again. 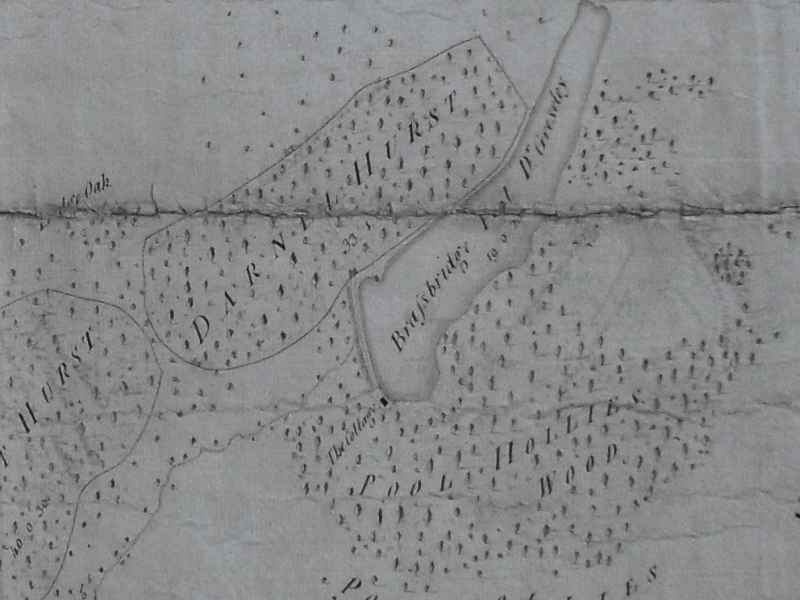 Details from the 1779 map of Sutton Park held at Sutton Reference Library. 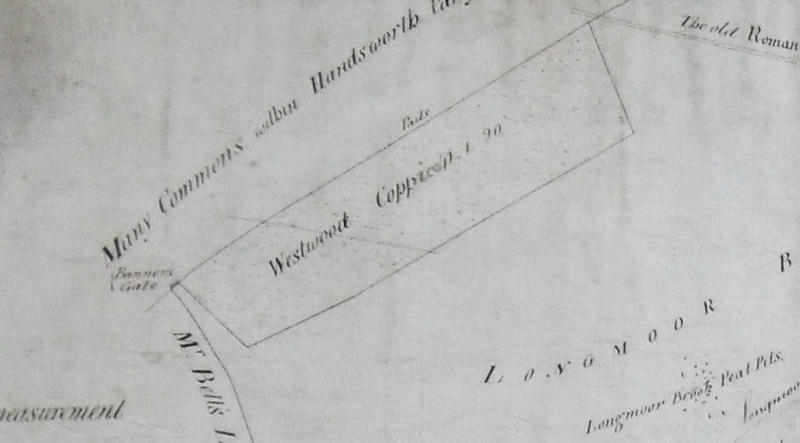 The old wood, Darnel Hurst, is shown with a curving boundary and full of trees, whereas Westwood Coppice has the straight boundaries of a new plantation, its exact acreage is given, and no trees are shown as they had only just been planted.